The Saint Lawrence River and Seaway System is a large hydrographic system in east-central North America, crossing the interior of the continent and providing the primary drainage of the Great Lakes Basin. The "Great Lakes-St. Lawrence Seaway System" extends approximately 2,500 miles (4,000 kilometers). Beginning at the North River in the U.S. state of Minnesota (which flows into Lake Superior), the system finally flows into the Atlantic Ocean via Cabot Strait in the extreme east of Canada. The St. Lawrence Seaway portion of the System extends from Montreal to mid-Lake Erie. The System traverses the Canadian provinces of Quebec and Ontario and forms part of the international Canada-United States border between Ontario, Canada, and New York state. It is of vital geographic, hydrologic, and economic importance to both countries. A major trade artery since long before the U.S. or Canada achieved nationhood, today from its ports, a multi-modal transportation network fans out across the continent. The 15 major and 50 regional ports of the system link to 40 provincial and interstate highways and nearly 30 rail lines, creating a vital transportation route connecting goods and consumers throughout North America. The Seaway system, which opened in 1959, is considered one of the most outstanding engineering feats of the twentieth century and serves as a model of international cooperation. Though the Saint Lawrence River itself is slightly less that 750 miles (2,000 km) in length, it is part of a much larger system which begins in the U.S. state of Minnesota, and in its entirety, covers approximately 2,500 miles (4,000 km). the beginning of the system in the Great Lakes region, which consists of narrow river-like sections connecting the lakes themselves. the central section, which is considered to be the beginning of the Saint Lawrence River at the outflow of Lake Ontario between the town of Kingston on the north bank, Wolfe Island in mid-stream, and Cape Vincent, New York on the south bank. From this point to the Île d’Orléans, just downstream from the city of Quebec, this section is considered to resemble a more normal river pattern. from the Île d’Orléans to the Cabot Strait, between Newfoundland and Nova Scotia, the system again widens, becoming the St. Lawrence estuary. As it passes Anticosti Island it becomes the oval-shaped marine region known as the Gulf of St. Lawrence. From its furthest headwater—the North River in the Mesabi Range at Hibbing, Minnesota—it runs approximately 2,500 miles (4,000 kilometers) before it releases into the Atlantic Ocean. Its drainage area, which includes the Great Lakes and hence the world's largest system of fresh water lakes, has a size of 390,000 square miles (1.03 million sq km). The average discharge at the mouth is 10,400 cubic meters per second (367,000 cu ft/s). The Saint Lawrence River itself includes Lake Saint-Louis south of Montreal, Lac Saint-François at Salaberry-de-Valleyfield and Lac Saint-Pierre east of Montreal. It surrounds such islands as the Thousand Islands near Kingston, the Island of Montreal, Île Jésus (Laval), Île d'Orléans near Québec City, and Anticosti Island north of the Gaspé. Lake Champlain and the Ottawa, Richelieu, and Saguenay rivers drain into the St. Lawrence. Saint Lawrence River between Quebec City (seen at left) and Lévis (seen at right). The Île d'Orléans appears further in the center. Saint Lawrence River along the New York-Ontario border. 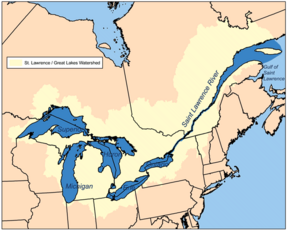 The heart of the North American continent is drained through the Saint Lawrence system, which occupies an ancient geologic depression, involving three geologic regions: the Canadian Shield, the Appalachian Mountains, and the intervening sedimentary rock platform. Toward the end of the Quaternary Period, the glaciers that had occupied the depression since the Pleistocene Ice Age were replaced by the Champlain Sea, which flooded the depression from about 13,000 to 9,500 years ago. A slight uplifting which occurred about 6,000 years ago expelled this arm of the ocean, forming the river course of the St. Lawrence. Plant life along the Saint Lawrence includes coniferous forest, open taiga, deciduous forest, and mixed forest areas. River-linked characteristics include sandbank grasses of the freshwater section and the halophytic (salt-tolerant) plants found from the middle estuary onward. The river's fish include such species as sturgeon, smelt, and herring. Mammals include the beluga whale; mollusks, the soft-shell clam Mya arenaria, among others. The entire river course experiences a massive migration of bustards, ducks, and geese, which make use of the sandy shores or river reefs as seasonal food sources. 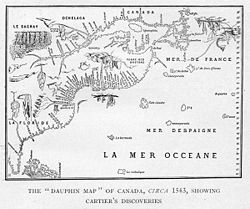 The first known European explorer to navigate the St. Lawrence was Jacques Cartier, who, in his search for a northwest passage to the Orient sailed through the Straits of Belle Isle in 1534 and landed on the shores of the bay. He returned to the area the following year, and entering the same gulf on the feast day of St. Lawrence, he named it the Gulf of St. Lawrence. He traveled as far as the Lachine Rapids, southwest of what is now Montreal, where he discovered he could go no further. The river was also navigated by French explorer Samuel de Champlain. Map of 1543 showing Cartier's discoveries. Until the early 1600s, the French used the name Rivière du Canada to designate the Saint Lawrence upstream to Montreal and the Ottawa River after Montreal. The Saint Lawrence River served as the main route for exploration of the North American interior. The St. Lawrence was initially continuously navigable only as far as Montreal because of the virtually impassible Lachine Rapids. In the eighteenth century processes began that would allow navigation into the heart of the continent. In the early 1780s, shallow canals on the St. Lawrence were enlarged for the passage of larger boats; the construction of the Erie Canal from Buffalo, New York, to the Hudson River occurred during the years 1817 to 1825; the first canal around Niagara Falls was opened in 1829; the Sault Sainte Marie (Michigan) lock was completed in 1855. At the beginning of the twentieth century, Canada promoted a plan to open the Great Lakes to sea traffic, however the United States did not support the idea. Treaties drawn up in 1932 and 1941 were not ratified by the U.S. It was not until May 1954 that the U.S. Congress finally approved participating with Canada in a joint project which eventually became known as the Saint Lawrence Seaway. The Eisenhower Locks in Massena, NY. Approval of the Seaway took place in May 1954, and construction began that summer. It was one of the largest civil engineering feats ever undertaken. During the five-year construction project, over 22,000 people took part in some aspect of its building. The cement used was enough to construct a 1,000 mile-long highway, with enough steel to encircle the earth. Bridges, tunnels, dikes, and roads were built. Existing locks were modernized and new ones were built. To overcome the navigational hazard of the swift-flowing, 226-foot fall of the St. Lawrence River between Lake Ontario and Montreal and to develop its hydroelectric power potential required an investment of more than $1 billion. Ten small communities in Ontario, home to 6,500 people, were submerged. Families and businesses in the affected communities were moved to new planned communities, with their former hometowns, now submerged, becoming known as "The Lost Villages." The creation of the seaway also led to the introduction of foreign species of aquatic animals, including the sea lamprey and the zebra mussel, into the Great Lakes Basin. These organisms were introduced via ballast water from oceanic vessels. The seaway provides significant entertainment and recreation such as boating, camping, fishing, and scuba diving. Of particular note is that the seaway provides a number of divable wrecks within recreational scuba limits (shallower than 130 feet). Surprisingly, the water temperature can be as warm as 70°F with little or no thermocline during the mid to late summer months. The seaway's opening is often credited with making the Erie Canal obsolete, thus setting off the severe economic decline of several cities in upstate New York. The seaway system was built through the cooperation of the neighboring countries of Canada and the United States. Though it is technically called "The Great Lakes/St. Lawrence Seaway," often the term "St. Lawrence Seaway" is used to describe the entire length of the system. Two separate entities therefore control the system: the Saint Lawrence Seaway Development Corporation is a federal agency within the U.S. Department of Transportation, and the St. Lawrence Seaway Management Corporation is a not-for-profit corporation established to manage the Canadian portion of the seaway, which is owned by that country's federal government. The two entities coordinate operational activities particularly with respect to rules and regulations, overall day-to-day operations, traffic management, navigation aids, safety, environmental programs, operating dates, and trade development programs. Because the seaway is bi-national, vessels using the system are are subject to a number of both Canadian and U.S. regulations. Some of the entities involved in the operation and safety of the system include: Canada Border Services Agency, Canadian Coast Guard, Canadian Food Inspection Agency, Environment Canada, Fisheries and Oceans Canada, Transportation Safety Board of Canada, U. S. Department of Homeland Security, U. S. Army Corps of Engineers, U.S. Coast Guard, U.S. Maritime Administration, and U.S. Department of Agriculture, among others. The size of vessels that can traverse the seaway is limited by the size of locks. 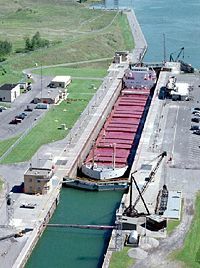 Locks on the St. Lawrence and on the Welland Canal are 766 feet (233.5 m) long, 80 feet (24 m) wide, and 30 feet (9.1 m) deep. The maximum allowed vessel size is slightly smaller: 740 feet (225.6 m) long, 78 feet (23.8 m) wide, and 26 feet (7.9 m) deep; many vessels designed for use on the Great Lakes following the opening of the seaway were built to the maximum size permissible by the locks, known informally as Seaway-Max. Large vessels of the lake freighter fleet are built on the Lakes and cannot travel down the seaway to the ocean. The only lock on the Great Lakes Waterway is 1,200 feet (357 m) long, 110 feet (33.5 m) wide and 32 feet (9.8 m) deep, but the channels are not kept that deep. Water depth is another obstacle to vessels, particularly in connecting waterways such as the St Lawrence River. The depth in the channels of the seaway is 41 feet (12.5 m) (panamax depth) downstream of Quebec City, 35 feet (10.7 m) between Quebec City and Deschaillons, 37 feet (11.3 m) to Montreal, and 28 feet (8.2 m ) upstream of Montreal. Channels in the Great Lakes Waterway are slightly shallower: 25 to 27 feet (7.62 to 8.2 m). In the late 1990s the seaway has been deepened and widened increasing near panamax sized ship access upstream from the Atlantic ocean to Montreal. Channel depths and limited lock sizes mean that only ten percent of ocean-going ships can traverse the entire seaway. Proposals to expand the seaway, dating from as early as the 1960s, have been rejected as too costly, and environmentally and economically unsound. Lower water levels in the Great Lakes have also posed problems for some vessels in recent years. ↑ 1.0 1.1 1.2 Encyclopædia Britannica Online (2008) Saint Lawrence River and Seaway Retrieved May 27, 2008. ↑ William Henry Johnson (1905) French Pathfinders in North America, Project Gutenberg. Retrieved December 21, 2007. ↑ 3.0 3.1 The St. Lawrence Seaway Management Corporation, Management of the Seaway Retrieved June 3, 2008. CBC Digital Archives. The St Lawrence Seaway: Gateway to the world Retrieved May 27, 2008. Encyclopædia Britannica Online. 2008. Saint Lawrence River and Seaway Retrieved May 27, 2008. Environment Canada. The St. Lawrence River: Gateway to North America Retrieved May 27, 2008. Government of Canada. The Lost Villages Historical Society Retrieved May 27, 2008. LexUM. Exchange of Notes, amending 1959 Agreement of Application of Tolls Retrieved May 27, 2008. Peace Palace Library. Bibliography on Water Resources and International Law Retrieved May 27, 2008. Saint Lawrence Seaway Development Corporation. The Saint Lawrence Seaway Development Corporation Retrieved May 27, 2008. The St. Lawrence Seaway Management Corporation. Great Lakes St. Lawrence Seaway System Retrieved May 27, 2008. The Ships List. Excerpt from the Illustrated London News, January 11, 1862. Canadian Canals Retrieved May 27, 2008. History of "Saint Lawrence River"
This page was last modified on 7 August 2015, at 19:11.